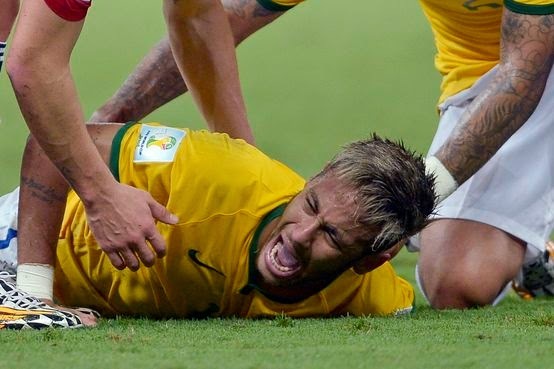 Neymar will miss the remaining of the World Cup with broken lumbar vertebrae. Today was Neymar’s last game at the World Cup. The Brazilian forward left the match in the 87th minute and was taken to a local hospital for full evaluation. Rodrigo Lasmar, Brazilian national team doctor, confirmed that the exams shown a fracture of the third lumbar vertebrae. According to the doctor it will take him four to six weeks for full recovery. Brazil won the match 2-1 against Colombia but now loses their biggest star and leading goal scorer for the semi-final and possibly final of the tournament. This is a huge blow for the hosts that will also be missing Thiago Silva in the semifinals due to accumulation of yellow cards.